This women's Munchkin costume is sure to be a hit on Halloween. 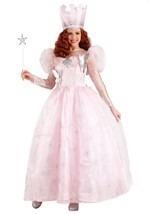 The costume has a green and purple 100% polyester dress that zips up in the back. The dress has a ruffled collar and puffy sleeves that narrow above the elbow. To top it off, the green and purple felt hat has a petal-like brim and a pointed top. Add our munchkin shoes for a fully authentic munchkin look.